Just came back last week from an amazing 4-day R&R in Azalea, Boracay! The trip was a last minute thing (thanks Paul & Kuya Melo for making me come with you hehe) and I said yes as soon as I got asked. Haha! You know naman I am all for adventures and all for travels, so go and YOLO my motto. In short, kaladkarin much. Lol. So anyway, our partner airline for this trip was AirAsia. Brought back fond memories of my Boracay trip last year with blogger friends! Same airline, same month. Feels. This time though, I came with a different group plus Ana and Paul, and it was EPIC. 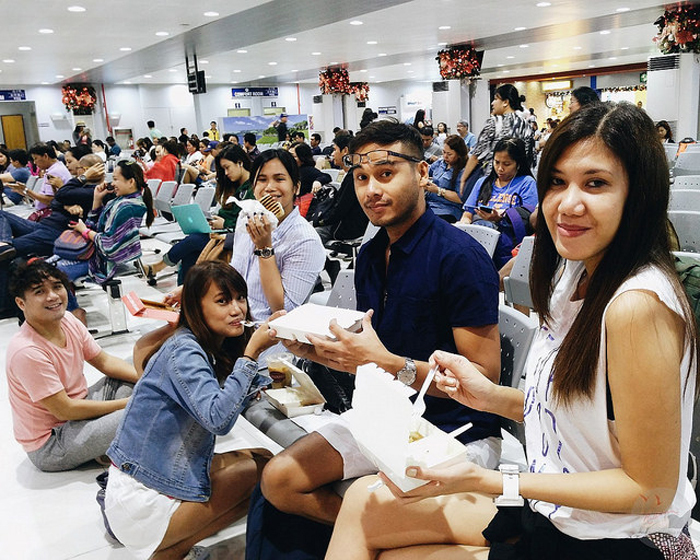 Stories from our flight to Kalibo! Thank God for low-cost airlines like AirAsia, now, budget conscious people like me can literally go places. It's not only budget friendly, it's also super convenient and hassle-free! Local flights fly from NAIA Terminal 4. We got Row 5! Rows 1-5 are premium seats. Meaning more space and more legroom. :) Fell asleep the whole trip. Don't forget to get insurance! Inavail ko to before for our Asia trip. For just a few hundred pesos, you get full coverage! Baggage, sickness, delay and in event of death, monetary support. Hi guys! Papi Rodel, Ruth and Ms. Jo! And there's Myke! Where's Kuya Melo? Our flight was slightly delayed and we had to wait for clearance before we can take off, but iz okay! The flight attendants were super nice and accommodating. They gave updates too. AirAsia now offers rice meals! Yehey! For patay gutoms like me, this is just heaven sent. Haha. They now have an Inflight Menu where you can choose and order from a wide variety of sumptuous rice meals like Bangus Sisig, Buffalo Chicken Strips, Barbeque Cola Beef, Vegetarian Chickpea Curry and Maan's Pasta Arabiata. YUM. If you are on a diet or a budget, you can still order cup noodles, sandwiches, water, chocolates, chips, cookies, cake, soda, coffee, etc. So many to choose from db? Order in advance to avail the 20% discount! Affordable inflight meals and food which you can order! Wanna try these rice meals! Next timeee. They also have merchandise for sale. I see Lagu! For hassle-free booking and check-in, download the AirAsia App! AirAsia's all-new mobile application offers innovative new features, smoother functionality and an improved interface to provide guests with an enhanced and seamless flying experience. The new app's features include "Add to Calendar", which automatically links upcoming flights to the calendar; faster and simpler flight booking process; and improved mobile check-in and Manage My Booking experience where guests can easily include various add-ons to their flight bookings. I actually use this app to check if there are promo fares, flight schedules and announcements! It's also a great way to manage your bookings especially if you're always on the road or on the go, like me. Used this app before to purchase additional baggage allowance and add insurance. You may also pre-book seats and meals. Aside from that, you will receive a mobile barcode when you check-in via the app. Just scan the barcode at the airport kiosk to print your boarding pass. You can also opt to get an e-boarding pass which allows you to go straight to the gate if you have no bags to check-in. Easy breezy!